Stone is one of the most beautiful and versatile components for a home’s landscape. Not only is stone an attractive natural element, it can also be used for both aesthetic and functional purposes. Whether you plan to use stone as part of an overall landscape design or to create a pathway or patio to enhance the natural elements of your yard, there are countless ways to achieve beautiful results. The first step toward creating a landscape with stone elements is to find a local landscape designer who is experienced in hardscape design. To create a balanced landscape, the design should implement both soft and hardscape elements. Softscape elements are the plants, flowers, shrubs, and trees—the living elements that change and grow throughout the season. Hardscape elements are permanent structures and additions to the landscape, like walkways, retaining walls, decks and patios. Stone can be used in a variety of unique ways to enhance softscapes, and create hardscape solutions that are both pleasing to the eye and functional. An Atlanta, GA landscape designer will understand local climate and soil conditions, and will suggest options that are both long-lasting and attractive. Natural stone isn’t the only option to use in landscaping. Cast synthetic stone is a man-made material created from concrete, and there are unlimited color options available. However, because cast stone is a manufactured product, it loses some of the unique features of natural stone and it may not be as durable. The color could fade over time. Natural stone holds up well to both natural and man-made elements, and will therefore last for years without any changes to its overall appearance. Each stone is unique with its own veining, color, and pattern. However, the cost for installing natural stone is usually higher, due to its labor-intensive requirements. Each stone must be shaped to fit the desired project. Even a small outdoor space can implement a water feature using stone. 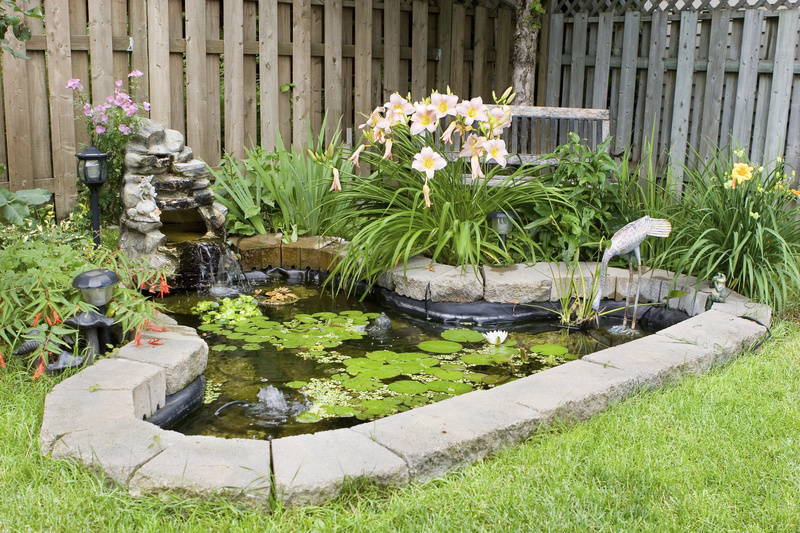 From a unique showcase fountain to a natural babbling brook or koi pond, the options are as vast as your imagination. An experienced landscape contractor can design a relaxing water element to enhance or showcase your yard using natural or synthetic stone. There are different reasons for installing a retaining wall, but its primary purpose is to prevent soil erosion. Oftentimes, homeowners create these retaining walls out of railroad ties. Unfortunately, wood ties don’t have a long life and will decompose over time. Retaining walls created out of natural or synthetic stone will ensure a long-term solution and enhance the aesthetics of a landscape. The most popular uses for synthetic or natural stone in landscapes are pathways or walkways, and there are limitless ways to create these unique and beautiful—yet functional—hardscape options. 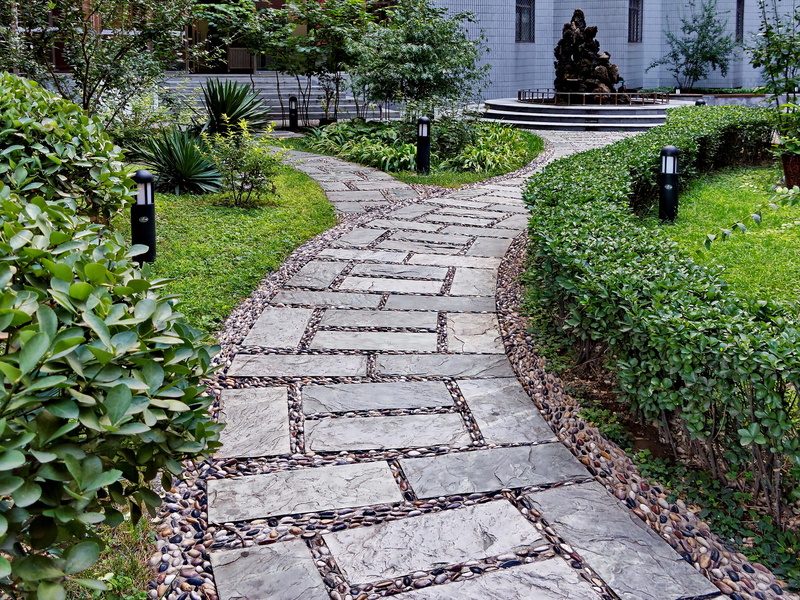 From a winding footpath created from individual natural stones to a solid walkway constructed of distinct geometric synthetic shapes, the choice is up to you. Make a list of the elements you’d like to see in the design and discuss those options with an expert in stone landscaping in Atlanta, but be open-minded. Experienced contractors can provide a wealth of ideas to help you create your perfect landscape.